Let’s follow the money trail. The Jan-Mar issue (see pg 7 top, in this PDF) of Hinduism Today, had a piece titled: “Avalanche of Christian Aid Falls on India.” The information was extracted from a report: “Receipt of Fereign Contribution by Voluntary Associations” (for 2005-2006) published by the Government of India’s Ministry of Home Affairs. In 2005-2006 for which the latest data is available, nine of the top fifteen agencies are Christian and six are secular. None are Hindu. These nine alone add up to $224 million coming into India. The State AND Central governments should investigate what the funds are being used for. How are these funds used in India? The Gospel for Asia mission for India: Plant another 300 Baptist Churches, start 10 Christian Schools and establish 3 Bible colleges within the next 10 years.” Yikes! Am waiting for the politicians to follow up on their own data and investigate! The Konkanis have faced their own persecution when Christians destroyed all their temples and attempted genocide. When the Portuguese took over Goa in the 1500s, they announced the Inquisition, a systematic pogrom to irradicate all aspects of Hindu culture. This genocide was with the blessings and encouragement of the Vatican. Archives have letters written by Francis Xavier (later sainted) asking the King of Portugal to give the order to impose the Inquisition in Goa. ALL Hindu temples in Goa were burn’t, the lands confiscated and given to the church. By edict, Hindus could not own any land; these were confiscated by the Church. Hindus were caught and beef was rubbed on their lips forcing them to convert. Resistance was met by burning at the stake! Hindus were prohibited from having any images or representations of the Gods and were prevented to even read their scriptures in the privacy of their homes. Later Christian missionaries have tried to whitewash their atrocities; see an example and discussion of the Revisionism here. ALL our Konkani temples in Goa were destroyed. Our family Kuldevata Ramnathi was originally in the village of Lotli in the district of Salsette. Our temple was destroyed in 1566 and records indicate that in Salsette alone, 280 temples were destroyed! Konkani faithful carried remnants of the deity across the Zuari to the region of Ponda, which was then not under Portuguese control. There our temples were rebuilt. Today the Ramnathi Devasthan stands magnificent, a symbol of a resilient people. And we vow: Never Again! 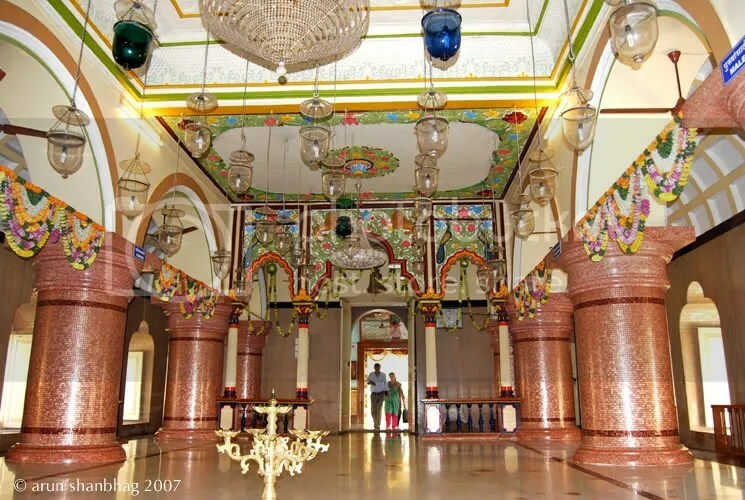 From my recent visit to Ramnathi; In this hall (antaraalay) devotees gather for divine grace! Thanks for the post for amazing information. Thank you; and also sad in a way.